French dips are one of my favorite sandwiches, and this homemade version is the best I’ve had yet. This is the perfect way to use that left over meat from pot roast or short ribs. I’ve included links at the bottom of this post to my favorite pot roast recipe (Mississippi Roast) and my Guinness-Braised Short Ribs recipe. Both of these recipes create wonderfully flavorful and tender meat, which is perfect for this French Dip. Heat the meat with its juice in a shallow casserole dish at 300 degrees F for about 20 minutes. Set the oven to broil, and broil the meat for about 5 minutes, or until the meat starts to brown and bubble a bit. Switch the oven back to 300 degrees F.
Slice the piece of French bread, but not all the way through. Leave a “hinge” at one side. Separate any fat from the meat and discard. Place the meat on one side of the bread, sprinkle with some parsley flakes, and top with cheese. Place the baking sheet in the oven and bake until the cheese melts. Put the juice from the meat in a ramekin or other small bowl to use as au jus for dipping. This recipe makes enough for 1 sandwich, so just double the ingredients however many times needed if you’re feeding more people. 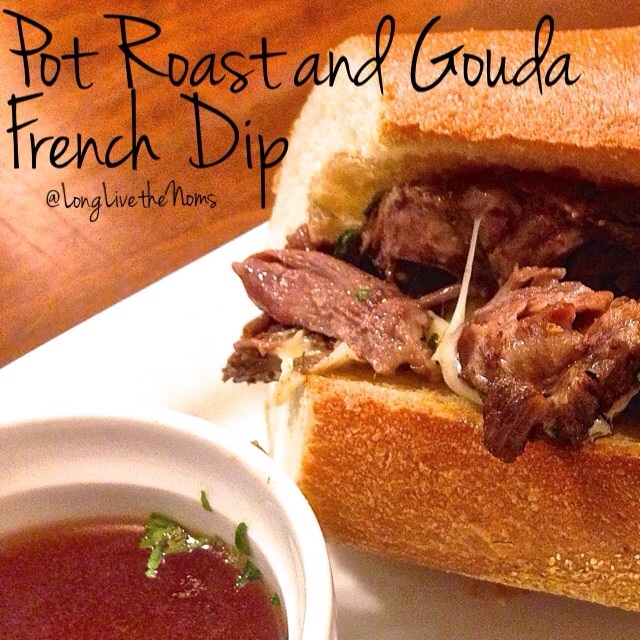 You can use whatever cheese you like or have on hand, but the Gouda with this pot roast meat is crazy good. Add some Dijon mustard for a little tangy kick if you’d like. If you don’t have enough leftover juice from the meat, you can use a beef bullion cube or granules to make some au jus. Leftovers are never boring when you use them like this. I plan to create many more dishes focused on using leftovers, so be sure to follow and check back often! 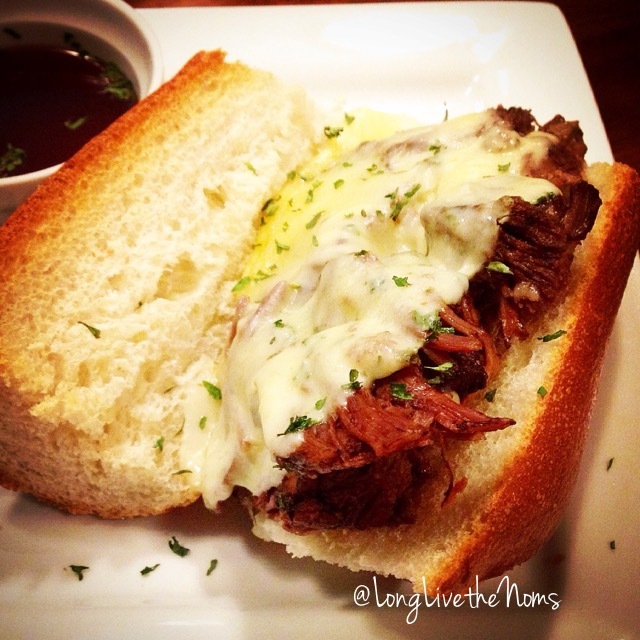 Posted in Dinner, Leftover Ideas, LunchTagged au jus, beef, dinner ideas, easy recipes, french dip, gouda, homemade, leftover roast, lunch ideas, pot roast, short ribsBookmark the permalink. These will blow your MIND!!! 😝 I hope you try them, and let me know what you think!